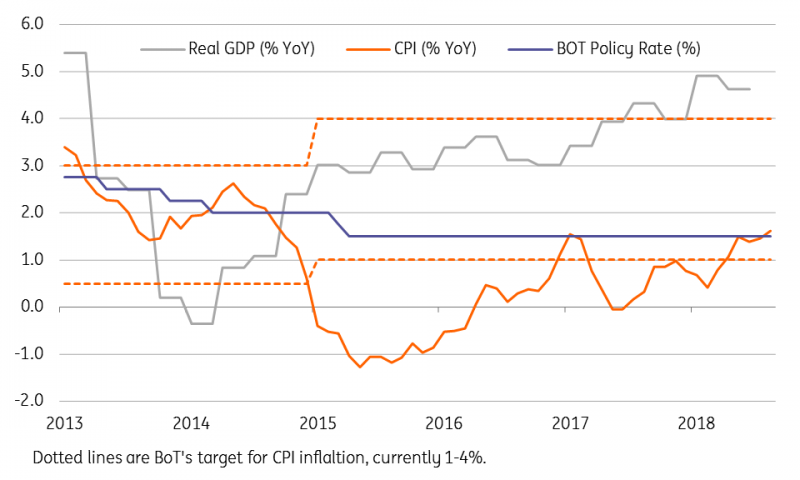 With inflation peaking, GDP growth poised to slow, and continued currency outperformance during the recent emerging market rout, the Bank of Thailand is under no pressure to move policy just yet. Thailand's consumer price index (CPI) rose 1.6% year on year in August, more than the (unchanged) 1.5% YoY expected by consensus. Core CPI, stripping out food and fuel prices, remained close to the 0.8% YoY level it has been around since May. Food price inflation was a source of upside surprise, rising to 0.8% from 0% the previous month. We didn't see this coming, though we weren't completely caught off guard on all other CPI components, which posted either lower or unchanged inflation from July. The transport component stood out for its sharp slowdown, resulting from recent lower global oil price inflation as well a s a high base-year effect. The 1% year-to-date inflation is at the low-end of the BoT's policy target of 1-4%. We see high base-year effects widening from the transport to the food components from September, pushing headline inflation below 1% in September. Our forecast for full-year 2018 average inflation is 1.1%. In an about-turn after fuelling expectations of policy normalisation in order to create some policy space for the future, BoT Governor Veerathai Santiprabhob has toned down his hawkish rhetoric. With GDP growth poised to slow - the BoT forecast 4.2% growth in the 2H18, down from 4.8% in 1H18 - and a large current surplus shielding the currency (THB) from the emerging market sell-off, stable BoT policy continues to be our baseline e xpectation for the remainder of the year.